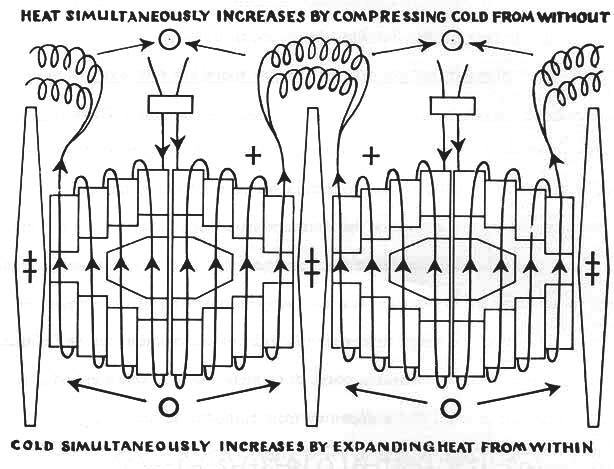 "Electricity is the result of three differentiated sympathetic flows, combining the celestial and terrestrial flows by an order of assimilation negatively attractive in its character. It is one of Nature's efforts to restore attractive differentiation. In analyzing this triple union in its vibratory philosophy, I find the highest order of perfection in this assimilative action of Nature. The whole condition is atomic, and is the introductory one which has an affinity for terrestrial centres, uniting magnetically with the Polar stream; in other words, uniting with the Polar stream by neutral affinity. The magnetic or electric forces of the earth are thus kept in stable equilibrium by this triune force, and the chords of this force may be expressed as 1st, the dominant, 2nd, the harmonic, and 3rd, the enharmonic. The value of each is, one to the other, in the rates of figures, true thirds. E flat- transmissive chord or dominant; A flat- harmonic; A double flat- enharmonic. The unition of the two prime thirds is so rapid, when the negative and the positive conditions reach a certain range of vibratory motion, as to be compared to an explosion. During this action the positive electric stream is liberated and immediately seeks its neutral terrestrial centre, or centre of highest attraction. Online electrical calculators for calculations of electricity and electronics.